A Little Magic for your Lips! 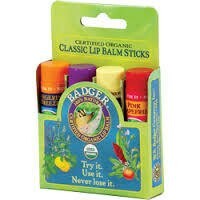 USDA Certified Organic natural lip balm from Badger in four flavors: Pink Grapefruit, Vanilla Madagascar, Lavender & Orange, and Tangerine Breeze. Made in New Hampshire. A Little Magic for your Lips! USDA Certified Organic natural lip balm from Badger in four flavors: Pink Grapefruit, Vanilla Madagascar, Lavender & Orange, and Tangerine Breeze. One Classic Lip Balm stick makes a great gift, so four must be extraordinary! Based in Organic Extra Virgin Olive Oil and Beeswax, these have a light texture, and sport the antioxidant powers of Seabuckthorn and Rosehip Extracts, as well as organic Aloe Vera Extract for dry weather soothing. Base Ingredients: *Olea Europaea (Extra Virgin Olive) Oil, *Cera Alba (Beeswax), *Ricinus Communis (Castor) Oil, *Aloe Barbadensis (Aloe) Extract, and CO2 Extracts of *Rosmarinus Officinalis (Rosemary), *Hippophae Rhamnoides (Seabuckthorn) & *Rosa Canina (Rosehip). Lavender Orange: Essential Oils of *Lavendula Augustifolia (Lavender), and *Citrus Aurantium Dulcis (Sweet Orange).